London Audio Visual are proud to be a beMatrix® LEDskin® UK Partner. 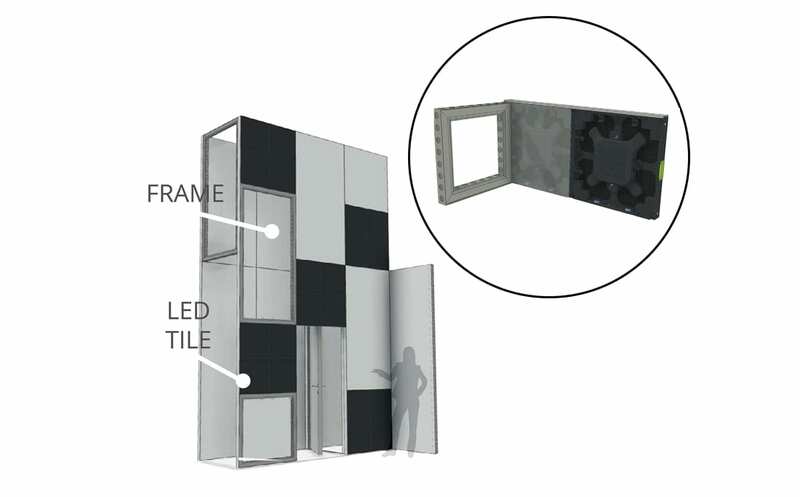 We are able to offer the exciting LEDskin® technology directly to exhibition stand builders, which means you are able to offer your client a unique and complete product for their stand. The beMatrix® LED system is a product designed and manufactured by beMatrix® to be used in conjunction with the modular stands. The LED screen unit is a clever technology that can create small or large interactive LED walls. As the product can easily be integrated into an existing stand build system, it makes setting up your exhibition stand quick, allowing your client to have more time to dress their stand as they wish. The final look is of one which creates a clean crisp display system, making your client’s exhibition stand look professional. Connecting the LEDskin® together creates a captivating video wall for the exhibition stand, which will leave your clients impressed with the display and pull in a larger footfall for them. The intelligent technology allows you to avoid using LED display screens and strategically use the LEDskin® to make your visual images appear seamless and clear. This also means that whilst your stand is being built our team can work alongside you to implement the locking LEDskin® panels, engineering your visual imagery to be at the highest quality. At London Audio visual we work with the UK’s leading exhibition stand builders to supply LEDskin®, allowing you to offer your client a package with integrated LED technology which will allow the exhibitor the chance to have an exceptional stand. Videos of the LEDskin® integrated into exhibition stands.